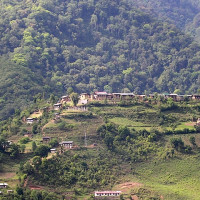 Even in a land recognized as one of 10 global “hotspots of bio-diversity,” the newly opened valleys of Nabji – Korphu have the reputation of being ecologically well-endowed. It is estimated that the region, harbors at least 395 species of birds, including the rare and beautiful Rufous Necked Hornbill. 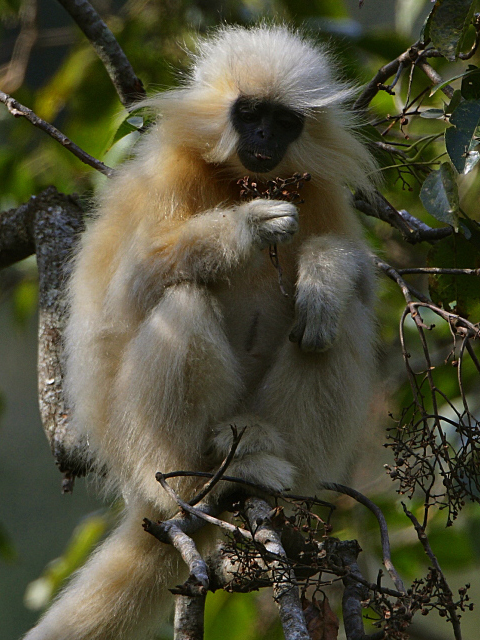 Otherworldly fauna, include Golden Langurs, one of the rarest primates that make frequent appearances along the route. The trek goes through terraced farmland, broadleaf forests with an impressive array of flora and fauna, through the rarely visited villages. Among them, we also meet elders from Shaman Monpa communities. This exceptional trek into the Edenic wonderland of Bhutan’s Jigme Singye Wangchuck National Park is perfect for those who want a low altitude trek in a remote, un spoilt area, with plenty of chance to interact with the friendly and hospitable local villagers. This trek is carefully designed to benefit the villages we pass through, who provide a local guide, porters, food and handicrafts. In agreement with the government, Wind Horse pays the villages for these services, ensuring that money goes back to the community and you are lucky enough to see an untouched and un spoilt part of Bhutan . Seasons: Although the trek can be done through-out the year, because of being in a low altitude area, it can be hot during summer and wet during the monsoon. The good time for this trek is from Oct till April. The trek is the first tourism effort developed to benefit local community. Local community park staffs provide porters, pack animals, campsite with shelter. 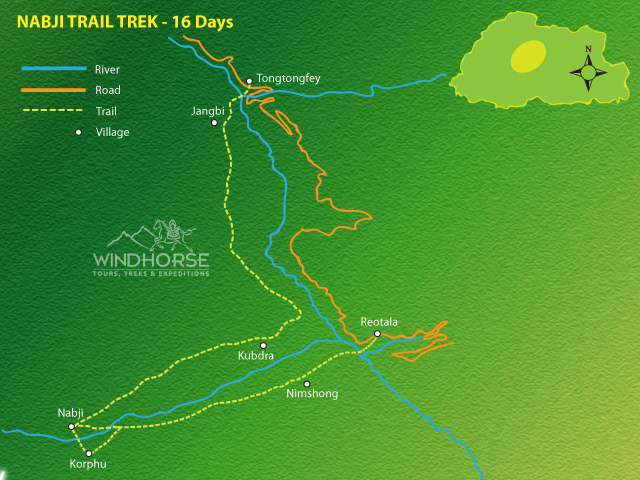 It trek in within the protected area of Jigme Singye National Park, formerly known as Black Mountains National Park. * Bhutan royalties, Visa, taxes and permits. * All transfers and transportation by good quality private vehicle. * English Speaking Guide through-out. * Accommodation in standard tourist hotels during tours and in tent camps during the trek. * All meals, including evening tea. * During the trek: fully organized trek with Tents, Thermal Pads, Blow pillow, Hot-water bag, Pack animals/porters to carry luggage. Basic Medical Kit, Cook and assistants. Beverages such as Juices, Tea, Alcoholic spirits are also provided during the trek. *Flights in and out of Bhutan. Booking will be done by us. * Personal trekking gears such as sleeping bag, clothing, shoes etc. * Personal expenses such as Tips and gratuities (optional), bar/beverages, laundry, telephone and others not listed in the included section. TREK DAY 1: TREK FROM RUITOLA (1037m/3,402ft) TO NIMSHONG (1,167m/3,828ft). 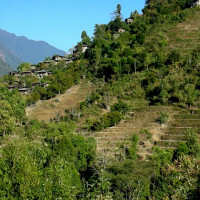 (Depending on your previous night’s accommodation), it is a short drive from Shemgang or Trongsa to the road head at Ruitola, where you will meet your trekking crew. From here there is a steep descent of about an hour and a half to the suspension bridge (703m/2,306ft) over the Mangde River. Spectacular cliffs dominate the landscape. Walk for another 3 hours through mixed forest until you arrive at a chorten indicating the entry to Nimshong village. Despite being within sight of Shemgang and its Dzong, the village of about 58 households is reliant on the trail you have just walked to link it to the outside world. The village is set on a steep hillside, with terraced fields on all sides. The campsite is at the top of the village below the Nimshong community school with spectacular views over the valley. TREK DAY 2: TREK FROM NIMSHONG TO KORPHU (1,500m/4,921ft). It is well worth while visiting the temple at Nimshong, and having a thorough look at the village before starting your trek today. After leaving the village, the path contours the hillside with great views across the valley. The path is generally very good, and it is about an hour until you leave the extended fields of Nimshong village. As you are in the National park zone, there are strict rules concerning land use and the path now leads through lush broadleaf forests with an impressive wealth of flora and fauna. You are very likely to meet villagers from Korphu, Nabji and beyond carrying goods to and from the road head. 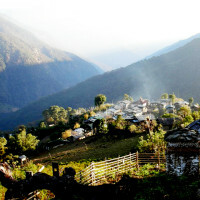 The trek is fairly easy until the final ascent (of about 1-2 hours) to Korphu village. You will pass Korphu community school before entering the village consisting of 76 households. The campsite is located above the village and you can enjoy great views of the valley and the village of Nabji with its terraced fields below. TREK DAY 3: TREK FROM KORPHU TO NABJI (1,367m/4,485ft). 2½-3 hours’ trekking, distance 6 km. Today’s walk is short and before you leave Korphu village you can visit its temple. 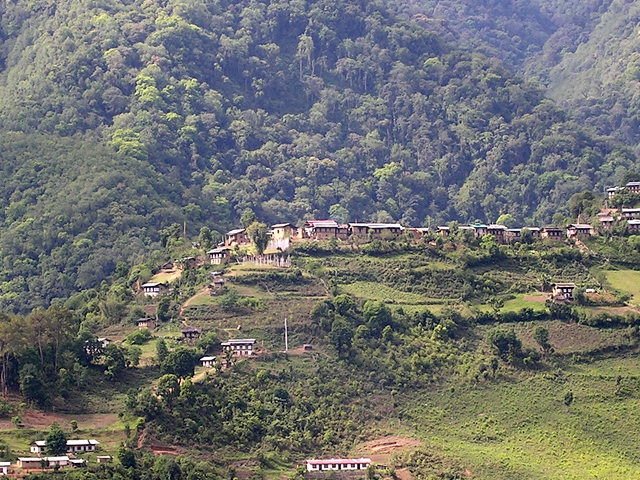 Korphu was where Terton Pema Lingpa, the famous saint and siddha of the Nyingma school, settled here for a while. His community of monks and nuns gradually marrying and formed the village. The temple houses Pema Lingpa’s sacred clothes and scriptures written in gold and a religious carving (done in one day). These sacred items are displayed to the public only once a year, during the festival. The trek starts with a long descent, crosses a stream and then ascends to the fan shaped fields of Nabji. Set in the middle of the paddy fields, just below the village is the famous and sacred temple of Nabji (whence all prayers and wishes are said to come true). The temple of Nabji or ‘Oath’ contains the stone pillar that marked the peace between the King of Bumthang and the Assamese King in the 8th century during Guru Padmasambhava’s visit. The peace was agreed at a point in the middle of the fields. Rock remains of a blacksmith (one of the reincarnations of Pema Lingpa) are also found nearby. 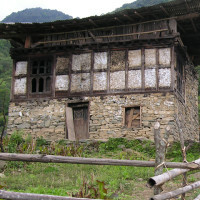 Nabji has about 50 houses, and again it is well worth while walking around the village. The campsite is situated just below the village in a small grove. 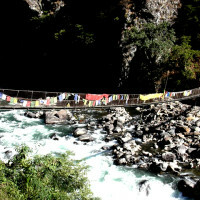 TREK DAY 4: TREK FROM NABJI TO KUBDRA (1,670m/5,479ft). 6-7 hours’ trekking, distance 13km. A long but beautiful day’s trek contouring and climbing up and down on the high sides of the valley. The trek goes through sub-tropical forests and you will have an excellent chance of spotting the rare and endangered Rufous-necked Hornbill and the Golden Langur monkey apart from other wildlife. 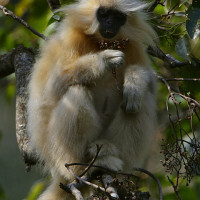 Dense forests, large trees with clippers, orchids, and bamboo forests and a wealth of bird life are seen today. Sacred traces of Guru Rinpoche can be seen along the route, and your guide will explain the significance of the various sacred rocks that you pass, including Guru Rimpoche’s cave, said to have multiple entrances. The area is also home to tigers and leopards. Kubdra is a tiny settlement, perched high on the valley side. Camp overnight. TREK DAY 5: TREK FROM KUBDRA TO JANGBI (1,368m/4,488ft). 6 hours’ trekking, distance 13km. Another fascinating day’s trek with an incredible wealth of flora. The forest changes from broadleaf to pine as the soil changes. Also seen, and of significance, are more holy sites such as Guru Rinpoche’s footprints, dagger and hat imprints. The path at one point climbs a seemingly impassable small cliff, the trail reputedly made by Guru Rimpoche on his flying yak. You will pass by the small village of Phrumzur en route and can soak in the view of the surrounding hills from the temple viewpoint. 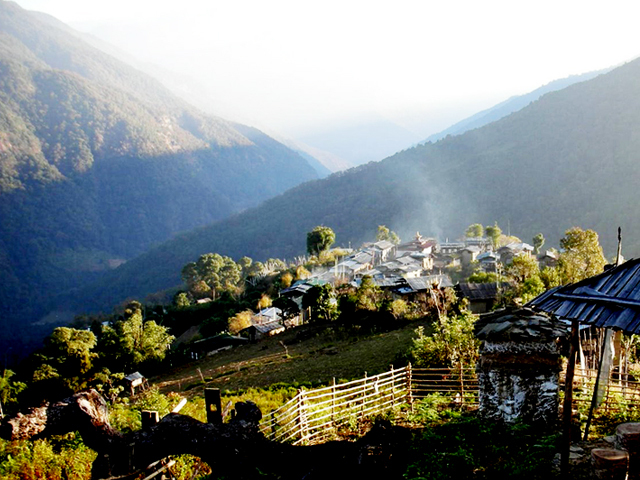 The village of Jangbi, home of Monpa people, believed to be the first inhabitants of Bhutan, is reached before finally arriving at your campsite 10 minutes later. This has a beautiful setting next to a tiny settlement. Here you can learn about the Monpa community and see their cane and bamboo handicrafts. TREK DAY 6: TREK FROM JANGBI TO TONGTONGFEY, DRIVE TO TONGSA. 3-4 hours’ trekking, distance 6km. 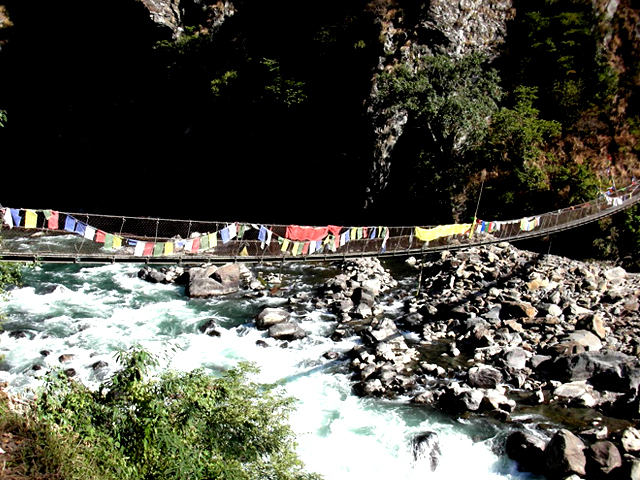 The roaring of the Mangde Chu River reaches you long before you can see it. You will cross side streams and pass isolated houses, as the path descends steeply at times, becoming gradual before reaching the suspension bridge (about 3 hours). This particular portion is quite tough and tiring on the knees! Another hour and a half later after a final uphill walk, you will emerge suddenly at the road at Tongtongfey where your transport will meet you to drive you to Tongsa. After lunch at restaurant in Trongsa, drive to your next destination. Day 3: Punakha – Trongsa Drive across Pele la pass into Trongsa (4hrs). This afternoon, we take short walk to visit its impressive fortress and the Watchtower among others. Overnight in hotel. 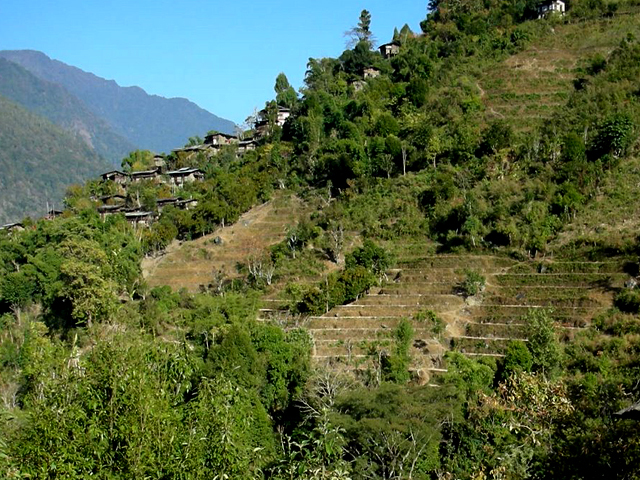 Transfer from Trongsa to the trail head and start trekking from Reotala to Nimshong. Day 5:Nimshong to Korphu (great day for some bird watching). 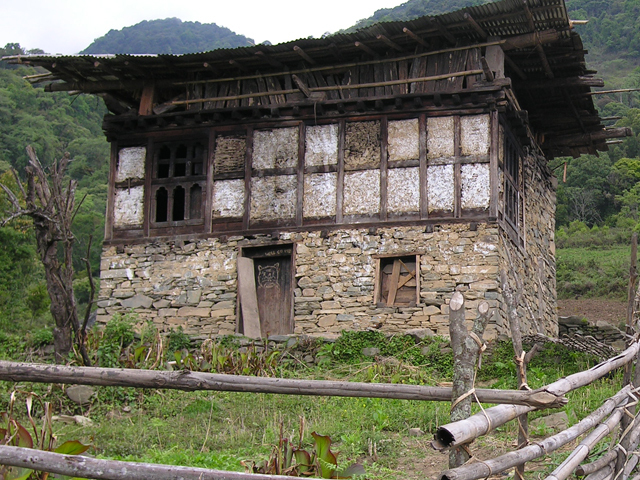 Day 6: Visit Korphu and short trek to Nabji and visit its village. Day 7: Long but beautiful day’s trek to Kubdra, through sub-tropical forests with excellent chance of spotting the rare and endangered Rufous-necked Hornbill and the Golden Langur monkey apart from other wildlife. Day 8: Another fascinating day’s trek with an incredible wealth of flora as the vegetation changes from broadleaf to pine. Meet and learn about Monpa people. 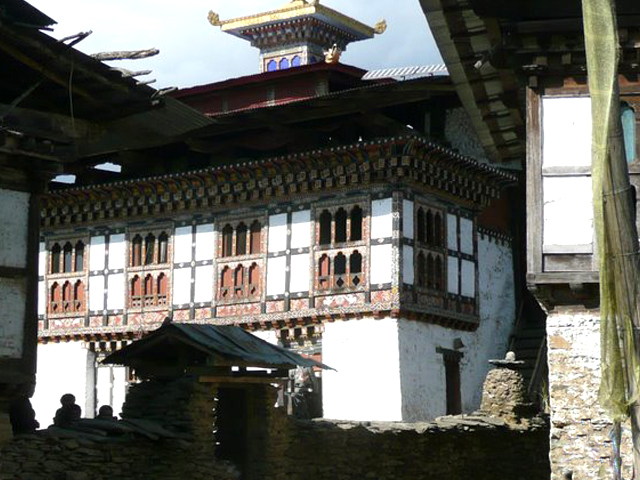 Day 10: Explore the monasteries and sites of the Bumthang Valley, the spiritual and cultural center of the country. Day 12: Drive back across Dochula pass to Thimphu. This afternoon is for touring in the capital, to visit some of its interesting attractions or free time to do as per your wishes. Overnight in hotel. Day 14: Full day for hike (excursion) to Taktsang or “Tiger’s Nest monastery. 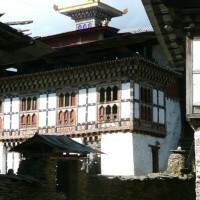 Upon return, visit the ruins of Drugyal Dzong. Overnight in hotel. Day 16: Departure transfer to the airport in time for your flight.